Experiments in Art and Writing. The book is Georg Trakl: Poems and Prose, translated by Alexander Stillmark, who also provides an excellent introduction. I love the book for its expressionism, its grimness, its excess. It’s strange. It’s cinematic; I mean that the book’s images resemble some of my favorite expressionist films: Vampyr or The Cabinet of Dr. Caligari or Nosferatu. The poems are almost haiku. Trakl strings together declarations that present images. 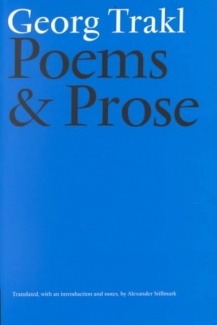 The images are frequently redundant in the context of his other poems. They are autumnal, with wine vats and crypts and crows and shepherds and skeletons and creatures and vagabonds and dark forests. The mood is always incredibly still and full of sighing, even if the imagery is over-the-top. Trakl’s poems remind me of Baudelaire and Aase Berg and Nerval and Keats and Bhanu Kapil and Poe (etc. ), and they remind me of H. P. Lovecraft’s stories and the moods in those stories. I love too the summers and summer storms that edge through the poems: “At evening the cuckoo’s lament / In the wood is silent. / The corn stoops lower, / The red poppy.” The poem continues: “Black storms threaten / Above the hill / . . . The leaves of the chestnut / Never stir. / On the winding stair / Your dress rustles.” On a side note, Trakl was obsessed with Kaspar Hauser, and he wrote a poem about Hauser. Coincidentally, soon after discovering Trakl’s poetry, I watched Werner Herzog’s The Enigma of Kaspar Hauser, which everyone should see: it’s a wonderful movie. 2. Where were you when you first read, or saw, or heard of this book? suburb, and one afternoon I ended up wandering around the suburb’s library. 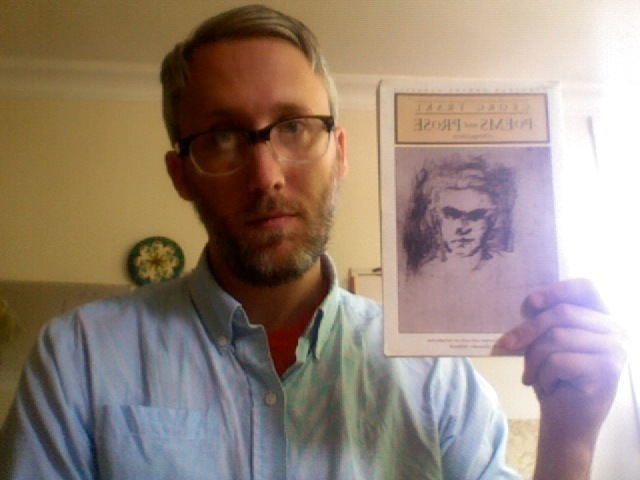 I found by chance a thin blue volume of Trakl’s poems and checked it out. I remember reading the collection on the train. It was in the middle of the summer: too hot and too bright, and I really missed the fall, and Trakl is so expert at creating that fall feeling. 3. Did this book influence your own writing, thinking, sense of the world, or work? When someone praises the “imagery” in a poem, it often seems like a veiled insult, as if images are somehow degraded things, somewhat unwelcome, perhaps too easy, definitely something one must justify with “content.” Trakl doesn’t “earn” his images. They are the poem, and the images are garish. They are redundant and gross and too much: “All silver a childlike skeleton shatters upon a bare wall.” That’s totally unnecessary, too weird, but it never leaves me. Reading Trakl is like being in a dim room full to the ceiling with broken furniture; it’s like Grimm’s fairy tales, and it’s like this. I am a shadow far from sombre villages. I drank from the spring in the grove. Spiders seek out my heart. There is a light that goes out in my mouth. Stiff with refuse and dust of stars. 5. Who did you send this book to, why? I dropped a copy on the train. It’s a hot summer, and it’s difficult to go outside. Philip Sorenson is the author of the recently released book of poetry OF EMBODIES. He lives in Chicago with his wife, Olivia Cronk, and their daughter, Louise. His poems have appeared in a variety of journals, including Hayden’s Ferry Review, elimae, Asymptote, and Saltgrass. He teaches writing and literature. This entry was posted in Philip Sorenson, Safety Book and tagged black rain, georg trakl, kaspar hauser, of embodies, Philip Sorenson, port trakl, vampyr. Bookmark the permalink.